Scrum is the fastest growing methodology for project management. These two-day ScrumMaster training classes are delivered by Certified Scrum Trainers (CSTs). Students will learn the tools and techniques to start utilizing Scrum on projects immediately. This ScrumMaster class curriculum is designed to effectively train, engage, and prepare students for practical use of Scrum tools and techniques. Classes include case studies, real world examples, activities and exercises that reinforce Scrum concepts. Following the class, students will be prepared to pass the Certified ScrumMaster (CSM) Exam. An exploration of the history of Agile methods and how they have brought us to the practices commonly used today in Scrum based software development. This history can help us understand the intricacy of Scrum and the nuances of the Scrum framework. 4. The Project Management "Iron Triangle"
An overview of the Scrum framework to inform students on key concepts and approaches. This module will seek to answer the most common implementation questions, including: Why should we use Scrum? How does using Scrum promote integrity and communication in the development process? Does using Scrum in development result in a better product and why? This module will focus specifically on Scrum Roles, including: What roles are defined in the Scrum game? What are the expectations of each role? 9. The importance of knowing when software is "done"
Understanding the Agile methods for projections and how they differ from traditional estimation and planning methods can help broaden your skills. Teams will use the concepts behind Agile methods of estimation to plan an entire project from inception to delivery by decomposing requirements and estimating actual work needed to meet stated goals. 11. Why Plan in an Agile Environment? To deliver the value that clients count on, we utilize Scrum techniques for the most effective development iterations. Why does this method result in a higher ROI for development projects? What aspects of Scrum can we count on for driving ROI and quality for the client? In this section, we examine the different impact of different aspects that affect our ability to deliver a quality product in the estimated time frame. Embodying and utilizing the methods of a ScrumMaster is much more difficult than reading about the concepts and rules of Scrum methodology. This module will identify the ways that a ScrumMaster functions in development , and what a ScrumMaster can use to assure that he or she is staying on track. 3. Being a ScrumMaster - how difficult is it? Detailed tools and approaches for key Scrum management approaches. This is an ad-hoc module where resources and concepts will be drawn from depending upon the needs and concerns of the class. Once all class modules have been completed, students will take and pass the online CSM exam, and become Certified ScrumMasters. Mr. Borsella is an IT professional with 24 years of experience in application development and IT leadership. He is also a Project Management Professional (certified by the PMI) and certified by the Scrum Alliance™ to provide Certified Scrum Trainer instructional services. His ability to contribute across a wide range of environments has taken him to companies such as First Data Corporation and eFunds Corporation, and outside the United States to India and Hungary. Peter is adept in administering all aspects of project management, as well as providing authentic leadership to create effective teams. An active and contributing member to both the PMI and the Scrum Alliance™, Peter's speaking engagements focus on bridging the gap between traditional Project Management and Agile Project Management. His goal is to help others understand how to get the best return from any project by achieving higher levels of software quality, increased customer satisfaction, and cohesive teams that enjoy increased productivity. Mr. Schatz specializes in training, consulting and coaching in the practice of successfully using agile project management techniques to transform their organizations and improve the performance of their software development projects. He began his practice as a result of leading the first large agile transition at Primavera and helping many other companies do the same. Bob has experience at every level of the organization. He was the VP and Chief Development Officer for Solstice Software, leading the software development of the Solstice enterprise integration testing products. Bob Schatz also served as VP of Development for Primavera Systems, Inc. where he was responsible for leading the team that develops Primavera's software solutions for Enterprise Project and Portfolio Management and created a real agile success story. Bob is a leader in successfully implementing agile development techniques, such as Scrum and XP, and driving culture changes in organizations. He holds a bachelor's degree in Computer Science from Temple University and a Masters degree in Organizational Dynamics from the University of Pennsylvania. Mr Rabon is an IT professional with over 13 years of industry experience. He is President of The Braintrust Consulting Group and is an Adjunct Instructor at University of Alabama at Birmingham where he leads clients of the Information Engineering and Management Master's Degree Program through the world of Business Process Modeling and Technical Project Management. Brian is an avid author, writing for organizations such as the Birmingham Business Journal and the University of Alabama at Birmingham. He also serves on the Board of Directors for TechBirmingham as VP of Programs for PMI Birmingham and as the founder of Agile Birmingham. Mr. Smith's 30 year IT career began at IBM in mainframe sales and at AT&T in product development. James's central focus is now on Scrum. First seeing the power of Scrum during a most dramatic of corporate turnarounds prompted his move to the role of ScrumMaster. Every one of the 26 Teams with whom he worked, taught him that Scrum was the most efficient and profitable way of developing software. As a member of Winnow Management, James is pleased with the opportunity to share all of his learnings assisting in the launch of new Agile Teams. He feels that Scrum, when properly implemented, makes life better for all involved. And at the end of the day, that is a very good thing of which to be a part. 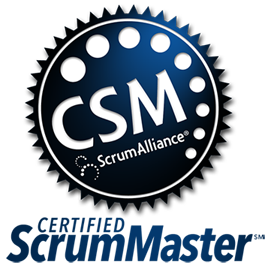 James is certified by the Scrum Alliance (sm) to bring Certified ScrumMaster training, and holds an MBA from Northwestern's Kellogg School of Management. Take the Certified ScrumMaster (CSM) exam and pass. Guaranteed.